Many food labels are confusing, if not downright misleading. While some food label claims have definitions controlled by the government, most do not have legal definitions. In addition, most label claims are "self-made" by the company merely for marketing purposes, and the accuracy of the claims is not verified. This information is also available as a concise pocket guide, and can be downloaded or ordered by clicking here. Below are definitions and the animal welfare implications of some of the most common labels applied to dairy, egg, meat, and poultry products. The labels are organized into four categories. Best choices (dark green), these labels feature the highest animal care standards and compliance is verified by a third-party auditing program. Next best choices (light green), these labels typically feature lower animal care standards, but compliance is verified by a second-party (such as a trade association) or independent third-party certification program. Potentially good choices (orange), these labels are relevant to animal welfare, but either no clear standard exists for the claim or compliance is not verified on the farm by a third-party audit. Consequently, the level of animal welfare can range from very low to very high for different products with the same label. Compliance with the USDA's definition is not verified on the farm by the government or any independent third party. Beware of these labels (red), these labels are meaningless or misleading with regard to animal welfare. They may not be meaningless or misleading for other purposes. You can click each label to see a more in depth description. AGA Certified Grassfed, a third-party certification program administered by the American Grassfed Association. The program's standards require continuous access to pasture and a diet of 100 percent forage. Confinement to feedlots and the use of hormones and antibiotics are prohibited. However, pain relief is not required for physical alterations such as the docking of tails and removal of horns. Also, no standards exist for the treatment of animals during transport or at slaughter. American Humane Certified, a third-party welfare certification program administered by the American Humane Association. Similar to other programs, this certification is based on audit compliance with comprehensive standards. However, the animal welfare level of the standards is lower than the other programs, just slightly above conventional industry animal care standards. A notable exception is the American Humane certification of pasture-raised eggs. The space standard for the label is 2.5 acres per 1,000 birds, which meets AWI’s standard for pasture-raised eggs. Unfortunately, American Humane does not require compliance with 100 percent of its standards. According to the USDA, this claim indicates the eggs came from hens who were "never confined to a cage and have had unlimited access to food, water, and the freedom to roam," but usually only within the confines of a barn. In fact, some cage free hens may not have much more space than caged birds. (“Cage free" is typically not used on eggs from hens who have access to range or pasture.) The USDA Agricultural Marketing Service (AMS) verifies "cage free" claims when made by USDA-inspected egg producers. The USDA verifies the claim with on-farm inspections conducted twice per year. The claim is not verified when used on non-USDA-graded eggs, unless the producer participates in a third-party program that certifies “cage free” claims pertaining to eggs. The label is meaningless when used on chicken or turkey products since, in the United States, birds raised for meat are not typically caged prior to transport to slaughter. Certified Animal Welfare Approved by AGW is the only USDA-approved third-party animal welfare food certification label that supports and promotes family farmers who raise their animals with the highest welfare standards, outdoors, on pasture or range. Standards cover the treatment of breeding animals, animals during transport, and animals at slaughter. The program, which was created by the Animal Welfare Institute, is administered by the nonprofit A Greener World (AGW), and offered free of charge to participating farmers. Certified Grassfed by AGW, an optional add-on to the Certified Animal Welfare Approved by AGW program, also administered by A Greener World. Requires that products come from animals fed a 100 percent grass and forage diet. Animals must be raised outdoors on pasture or range, and they must be managed under the high animal welfare and environmental standards of the Certified Animal Welfare Approved by AGW program. Certified Humane, a third-party animal welfare certification program administered by the nonprofit Humane Farm Animal Care. Although access to the outdoors is not required for egg-laying hens under the seal, Certified Humane offers an additional certification to designate free-range and pasture-raised hens. The free-range designation requires daily access to an uncovered outdoor area providing a minimum of 2 square feet per bird. This does not meet AWI’s standard for free-range eggs. However, Certified Humane’s standard for “pasture raised” is 2.5 acres per 1,000 birds, which meets AWI’s standard for pasture-raised eggs. Certified Humane offers both a year-round and seasonal pasture option. 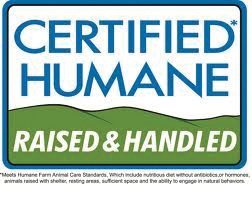 Certified Humane, a third-party animal welfare certification program administered by the nonprofit Humane Farm Animal Care. Access to the outdoors is not required for meat birds, egg-laying hens, and pigs; however, minimum space allowances and environmental enrichment must be provided. Beak trimming of hens and turkeys and tail docking of pigs are allowed under certain circumstances. Standards include the treatment of breeding animals, animals during transport, and animals at slaughter. Certified Naturally Grown, a nonprofit program offering certification tailored to small-scale, direct-market farmers using natural methods. Developed to be a streamlined, less expensive alternative to the USDA Organic program, this is not a typical third-party certification program, but rather a “participatory guarantee system” that aims to directly link up consumers and farmers. Inspections consist of a peer review conducted by another farmer. Standards are based on the USDA Organic program with additional requirements for animal welfare, including minimum outdoor space for birds. The USDA does not define this claim, but requires that the definition be provided on the label, either next to the claim or connected to the claim by a symbol on the label panel where the claim is first made. Typically, the claim is used to indicate that the animal was not housed—and is not the offspring of an animal so housed—at any time in a gestation crate (used to confine sows during pregnancy) or a farrowing crate (used to confine sows from just before birth until the piglets are weaned). However, it is possible that some producers are using the claim to signify avoidance of gestation crates only, while still using farrowing crates. The USDA does not define this claim, but requires that the definition be provided on the label, either next to the claim or connected to the claim by a symbol on the label panel where the claim is first made. Typically, the claim is used to indicate that a calf was not housed at any time in a crate, or any enclosure small enough to prevent the animal from freely turning around or lying down. These claims are subjective and misleading. In addition, no third-party certification programs exist for these claims. Since these claims are not defined by the USDA, the producer is required to include on the label an explanation of what is meant by the claim. These claims should be considered a marketing tactic with little or no relevance to animal welfare. 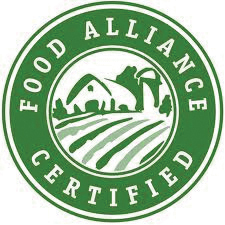 Food Alliance Certified, a non-profit sustainable agriculture certification program that supports "safe and fair working conditions, humane treatment of animals, and careful stewardship of ecosystems." Standards provide for access to natural light, fresh air, and adequate space, but access to the outdoors is not required for all animals. Pain relief is not required for most physical alterations, including beak trimming and tail docking. The program's audit criteria allow a farm to become approved based on an average score for some areas instead of requiring that every standard be met. Standards do not include the treatment of animals at slaughter. This claim, indicating that hens were allowed access to the outdoors, are verified by the USDA when made by USDA-inspected egg producers. The USDA verifies the claims with on-farm inspections conducted twice per year. The claims are not verified when used on non-USDA-graded eggs, unless the producer participates in a third-party program that certifies “free range” and/or “pasture raised” claims pertaining to eggs. The USDA definition does not specify how often or for how long birds must be given outdoor access. It also does not specify minimum space allowances or whether vegetation must be provided. The USDA allows the use of this claims on poultry products if the producer submits animal care protocols and/or affidavits describing the conditions under which the birds are raised. Some USDA documents define “free range” for poultry as having "continuous, free access to the outdoors for a significant portion of their lives (defined sometimes as “over 51 percent” and sometimes as “a majority” of the birds’ lives). The 2016 USDA labeling guideline on animal-raising claims states that the claim must be defined on the label. As with the “free range” claim in eggs, the USDA definition does not specify how often or how long birds must be given outdoor access, what amount of space is acceptable, or whether vegetation must be present. Because birds may be housed indoors for inclement weather and other reasons, and given that chickens raised for meat are slaughtered at just 42 days, it is possible that some free range chickens never step outside. The USDA Food Safety and Inspection Service approves these claims on products from mammals (while the claims “free range” and “pasture raised” are approved on products from birds). Some USDA documents apply the same definition for these terms as “free range”: continuous, free access to the outdoors for a significant portion of their lives. However, the 2016 USDA labeling guideline for animal-raising claims defines these terms as “continuous free access to the outdoors for a minimum of 120 days per year. The USDA has stated that "feedlot-raised livestock or any livestock that were confined and fed for any portion of their lives are not amenable to the meaning of these terms." Global Animal Partnership is a rating program as opposed to a certification program with only one set of standards. Producers are certified on a six-tier scale, from Step 1 to Step 5+. Feedlots are prohibited and access to pasture is required for all animals at Step 4 and higher. All physical alterations are prohibited at Step 5. Standards include the treatment of animals during transport and at slaughter. Global Animal Partnership is a rating program as opposed to a certification program with only one set of standards. Producers are rated on a six-tier scale, from Step 1 to Step 5+. Standards for Step 1 are only marginally better than those of the conventional industry; therefore Step 1 products are not recommended. For poultry and pigs, continuous indoor confinement (with enrichment) is allowed at Step 2. Very limited access to the outdoors and minimal vegetation is provided at Step 3. Feedlots are allowed for cattle at Step 2. Beak trimming is allowed in turkeys, but is prohibited in hens and meat chickens. Tail docking of pigs is also prohibited. Standards include the treatment of animals during transport and at slaughter. The USDA withdrew its voluntary definition for this claim after the agency determined it did not have the authority to establish animal-raising definitions. The standard had required a lifetime diet of 100 percent grass and forage and had prohibited grains. Pasture access during most of the growing season was required, but confinement and the administration of hormones and antibiotics were not prohibited. After withdrawing the “grass fed standard, USDA launched a “certified grass fed” program for small producers. The program is designed for producers who, each year, market fewer than 50 cattle or market lambs produced from fewer than 100 ewes. Animals certified under this program must be fed only grass and forage, and cannot be fed grain or grain by-products, and must have continuous access to pasture during the growing season. In approving this claim, the USDA accepts the USDA certification program, as well as other definitions offered by producers. The USDA considers “grass fed” to be a diet claim, and does not require that producers address other aspects of animal raising, such as confinement or the use of antibiotics and hormones. "Halal" may be used on the labels of meat and poultry products prepared according to Islamic law and under Islamic authority. The U.S. Humane Methods of Slaughter Act exempts animals killed for religious purposes from the requirement that they be rendered insensible to pain ("stunned") before shackling, hoisting and cutting. Consequently, Halal products may come from animals who have been slaughtered without being pre-stunned. Most animal welfare advocates consider slaughter without prior stunning to be inhumane. The USDA does not have a set of independent standards for certifying products as “humanely raised.” The department will merely verify that the producer has met its own standards, and as such the claim may simply represent a marketing tactic with little relevance to animal welfare. Because these claims have not been defined by the USDA, they should be considered meaningless and/or misleading unless verified by a third-party certification. "Kosher" may be used on the labels of meat and poultry products prepared under rabbinical supervision. Kosher products are typically produced from animals who have been killed without being rendered insensible to pain ("stunned") before shackling, hoisting and cutting, which is allowed under an exception to the US Humane Methods of Slaughter Act for ritual or religious slaughter. Most animal welfare advocates consider slaughter without prior stunning to be inhumane. Although a "natural" claim may be used on eggs and dairy, the USDA definition for the term only applies to meat and poultry. According to USDA policy, "natural" can be used on a product that contains no artificial ingredients or added color and is only minimally processed. The label must explain the use of the term. Unless so noted, the term is not an indication that no hormones or antibiotics were administered. The claim has no relevance whatsoever to how the animals were raised. No regulatory definition for "natural" currently exists, but the USDA and the FDA are considering establishing one. A voluntary standard was established for producers wishing to have this claim verified by the USDA. The claim indicated that the meat came from animals who did not receive antibiotics and hormones and were fed only a vegetarian diet. The definition did not require the improved living conditions for the animals that most consumers would expect of the claim, such as access to pasture or range. According to the USDA, it is no longer verifying this claim due to confusion with the “natural” claim, and therefore the claim should not be found on any products from animals. The USDA does not approve "hormone free" claims, as all animals produce hormones naturally. "No added hormones" or "no hormones administered" claims can be used if documentation is provided showing no hormones were administered during the course of the animal's lifetime. The USDA does not routinely test for the presence of hormones, so no verification system exists. The USDA prohibits the use of hormones in the production of poultry, veal, and pork, and any "no added hormones" claims on these products must be accompanied by a statement to the effect that the administration of hormones is prohibited by federal regulation. Such a claim on pork, veal, or poultry should be considered a marketing ploy with the sole intent to mislead consumers. The claim "antibiotic free" is not allowed because antibiotic-residue testing technology cannot verify that an animal has never received antibiotics. However, the USDA does allow "no antibiotics administered," "no antibiotics added," and "raised without antibiotics" claims if the producer can show documentation that the animals have not received antibiotics at any point in their lives for any purpose, including treatment of illness. Producers must also document procedures for handling sick animals. Since non-therapeutic antibiotic use can be one indicator of intensive confinement, this claim has some relevance to animal welfare. On the negative side, however, some producers may choose to allow a sick animal to suffer instead of treating the animal, for fear of losing the opportunity to use the "raised without antibiotics" claim. This is a diet claim that has no relevance to animal welfare. The claim indicates that Omega-3 fatty acids were fed—in the form of flaxseed, algae, or fish oil—to the hens who produced the eggs. Generally, "pasture raised" is used to indicate that a food product came from animals provided with continuous access to pasture and natural vegetation. However, no regulatory standard for the term exists. Some USDA documents apply the same definition as for the “free range” claim—animals had continuous, free access to the outdoors for a significant portion of their lives, while the 2016 USDA labeling guideline on animal-raising claims states that the claim must be defined on the label. In any case, it should not be assumed that animals were not confined for some period of time, unless the claim is verified through a third-party pasture certification program, such as Certified Animal Welfare Approved by AGW. A certification program developed by and for the egg industry. Since the standards are set by UEP itself, the certification cannot be considered independent or third party. The program's standards allow hens to be crowded into small cages for their entire lives without any access to pasture, fresh air, or sunlight. The birds are also denied litter for dust bathing and boxes for nesting. Beak trimming without pain relief is allowed. UEP renamed the seal after federal regulators and the Better Business Bureau found the previous "Animal Care Certified" label to be misleading. 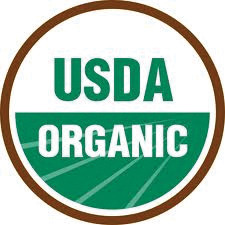 USDA Certified Organic standards are defined by regulations of the National Organic Program. The standards are general and apply to all animals. They don't address many animal care issues such as weaning, physical alterations, minimum space requirements, handling, transport, or slaughter. The standards require some access to the outdoors for all animals, access to pasture for ruminants (cattle, sheep, goats), fresh air and sunlight, and freedom of movement. However, the USDA has allowed screened porches to qualify as outdoor access for birds. Physical alterations such as the removal of horns and docking of tails are allowed without pain relief. Compliance with the standards is verified by a USDA-accredited organic certifying agency, but an audit by the USDA Office of Inspector General revealed that consistency among certifiers is a problem. Consequently, the level of animal welfare varies widely among producers. The Cornucopia Institute offers a scorecard that rates organic dairy and egg producers. The USDA offers the Process Verified Program seal to producers as a marketing tool. Participating producers submit their standards for consideration, and after approval is granted, the USDA conducts audits to verify that the company is following its own standards in raising animals. Hence, the meaning of a terms such as “animal care” and "humanely handled" can vary widely among producers, yet all are eligible to receive USDA Process Verified approval for the claim. In fact, products from factory-farmed animals can and do carry the PVP seal. This claim, indicating the diet did not contain animal byproducts, has no relevance to the conditions under which the animals were raised.